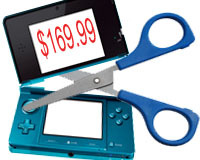 3DS Gets A Price Cut, Will This Affect PS Vita Sales? The reason for this radical and out of the blue cut is because of low sales and a poor fiscal year for Nintendo, Reggie Fils-Aime had this to say..
"For anyone who was on the fence about buying a Nintendo 3DS, this is a huge motivation to buy now,"
So what does this mean? and what has it got to do with the PS Vita? well basically when Sony announced a similar $249 price for the PS Vita, many were surprised at the low price of the device, mainly because of features such as a OLED screen and a Quad-Core Processor. And with such a competitive price many were now considering PS Vita to be this years "Winner" of the handheld world. But with this price cut, what will SONY do in return? will they slash the price as well? or maybe throw a curveball with a complete redesign, we will just have to wait.